Dr Jim Saleam For Cootamundra – For An Ideological Revolution. Australian Nationalists will always put Australians first, unlike globalist Liberal-Gnats coalition, the Labor-Golly Greens coalition and their stooges pretending to be independents. Where’s Katrina Hodgkinson these days? Swanning around Switzerland before she takes on a plumb job with a multinational? Clean out the country gentry! 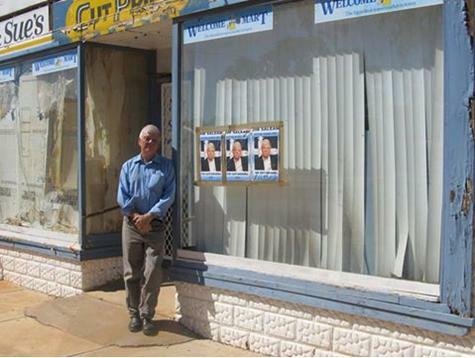 Jim outside the shopfront that will be used in the 2019 campaign for the New South Wales State seat of Cootamundra. Listening to the locals is a must. Ending imposed mass immigration is a priority policy – starting with Muslims, Chinese and those who don’t speak English. The big threat facing the Riverina region is Chinese Imperialism and their corrupt National Party connections. And there are bigger issues at hand for Dr Saleam – imposed mass immigration, more police resources in the region and mandatory sentencing to curb the ICE crime epidemic, unaffordable energy despite Australia being rich in coal and gas resources, the demise of Australian manufacturing by anti-Australian policy, Australia’s sovereignty being compromised by foreign ownership, leftist agendas like climate alarmism undermining Australian opportunities, multiculturalism undermining Australian values and the family unit, and the erosion of democracy and free speech in this country. Dr Saleam also criticised increasing numbers of Syrian refugees in Australia, saying the Syrian civil war is all but over and so Syrians should return home to rebuild their homeland. “Syrian President Bashar al-Assad invites them back”, Dr Saleam said.